The wedding planning process can be a daunting task. What to plan first, where to begin, what to discuss with the event planner? These four helpful tips can help take away a bit of the stress. When your wedding service provider receives your first email, they don’t know anything about your budget, preferences or needs – unless you tell them. In order to receive the most accurate initial quote, it is crucial that you let them know what is most important to you and why. Give them all details needed – like date, location, the number of guests, and services interested in. Of course, you may not have all this nailed down yet, which is absolutely fine! Start with what you DO know – this can help your potential vendors greatly. You will get better and faster results if you provide good photos and descriptions of the image you have in your mind for your ideal decor, food service, or entertainment. Take a look at our website to find specific items or, better yet, get in touch to schedule a complimentary consultation at either of our showrooms in Denver or Colorado Springs to see our inventory first hand. Additionally, look for images on Pinterest or for inspiration on Instagram, save photos on the phone or tablet, cut them from magazines, etc. Brides beware, however – with Pinterest comes the need to remain flexible. Your budget may be completely different from the couple who hosted the wedding you just pinned. Think of Pinterest as a place to gather inspiration for the tone and feel of your wedding, not necessarily a place to find exact images to replicate. Which brings us to…. Simple doesn’t mean cheap, as much as fancy doesn’t mean expensive. Many couples say “we want a simple outdoor wedding” and do not realize they have the same end cost as a gala at a grand hotel. At Colorado Party Rentals, there is no budget too small or too big. We accommodate your needs and help you make the best of your investment. We all know that the cost of a wedding can add up quickly. Having a set number in mind when you begin the planning process can help keep your heart (AND checkbook!) in line. 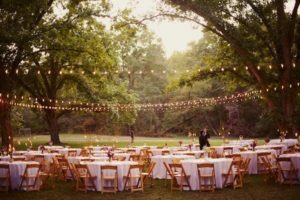 If you choose Colorado Party Rentals as your wedding rental provider, you can be sure that we have vast experience and will do our best to make your wedding dream come true. We listen to your wishes and look for the best options to fulfill them. If we feel there is another option that you haven’t yet considered, we will let you know. 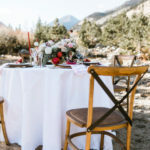 There are many incredible Colorado wedding vendors and we are all here to help take away the stress of your big day and make sure it goes off without a hitch. Book an appointment to visit one of our Showrooms and let us be a part of your special day.